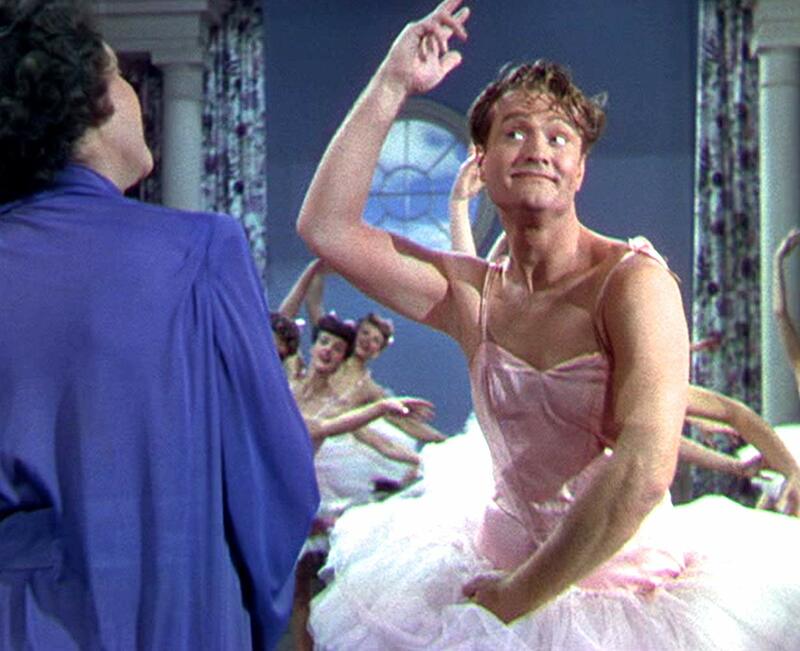 The splendor of MGM’s technicolor look is abundant when Red Skelton finds himself trying to win back the hand of swimming star Esther Williams in this enjoyable romp that sees an overaged Red enrolled in an all girls college where Miss Williams is a member of the faculty. It’s a screwball musical when Red stars as an in-demand songwriter for both Harry James and Xavier Cugat and their respective orchestras. Problems arise when Red is more interested in the new love of his life, Miss Williams while at a California resort. 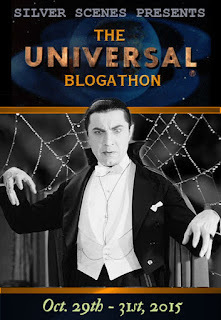 He’s lost his interest in writing and that has Broadway producer Basil Rathbone resorting to underhanded tactics to get Red back on the path to writing a new set of songs before a fast approaching due date. This leads to a hilarious scene when Red and Esther are exchanging nuptials. Basil has hired a Latino chorus girl to crash the wedding claiming she’s already married to Red. To prove it she has her three young Latino boys with her. All with red hair! Red is claiming innocence and Esther is headed for the first train out of town after accusing him of being a “red headed bluebeard.” She’s moving back to a New Jersey all girls college and Red is in hot pursuit with his singing minstrel, Carlos Ramirez, in tow. All against the wishes of the scheming Basil. No men are allowed on the college grounds other than faculty members including Bill Goodwin who will be Red’s nemesis in the romance department. It’s while catching a Harry James number at a local club that Red will meet Donald Meek who whispers that there is a little known bylaw allowing Red to enroll which in turn would get him on the grounds to win back his lady love. And so he’s off to college leaving the school Dean, Nan Bryant and the other members of the staff plotting on just how to have him expelled before word gets out to the parents of the students that a MAN is now attending classes. There’s a great secondary role in here for the attractive Jean Porter as a student who joins Red in song during music class. 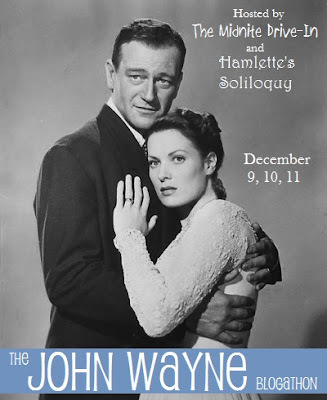 When Red has been assigned to rework a song he brings in Harry James and along with Jean stages a comically energetic routine for the class earning him an A in music. Not what the music professor had in mind. Still to come is Red in ballet class which is a hoot just to see him in his class outfit. When Basil catches up with him he even enlists Sherlock to help with his homework assignments if he’s to finish the songs for the Broadway show. Don’t be surprised to hear that Basil turns in some first rate papers. Hey I forgot! 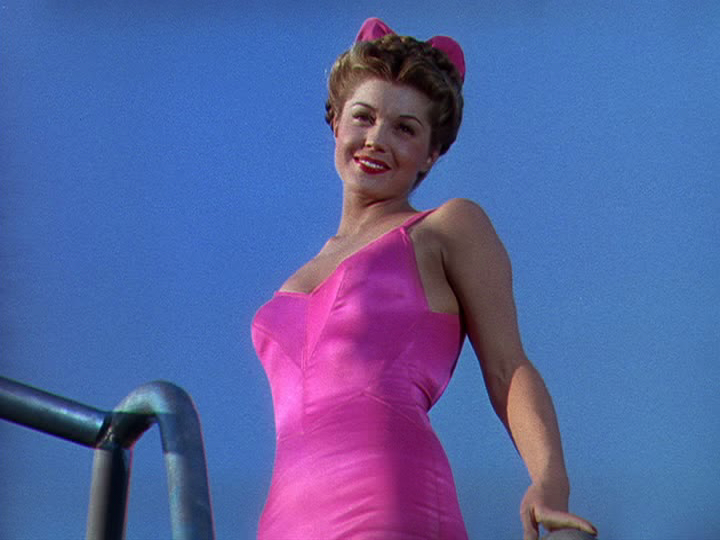 This is an Esther Williams feature as well as a Red Skelton comedy. That means plenty of time by the poolside and yes Esther doesn’t disappoint her fans with ample time spent by the camera catching her in a swimsuit both above and below the surface of the water. As this is a screwball don’t be surprised if Red comes close to winning Esther’s love once again only to experience some setbacks thanks to that Latino gal proclaiming to be his wife resurfacing. Red’s fit to be tied and just wants to get his hands on whoever it was that put her up to this cruel lie. No need to spell the rest out but let’s not forget that MGM head of state, L.B. Mayer loved a happy ending. 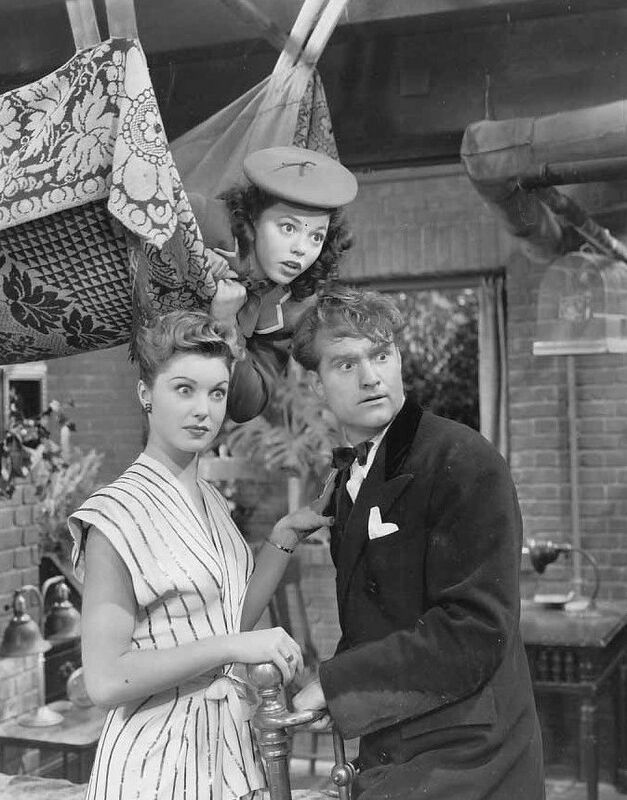 Red and Esther would appear in a number of films together following their first teaming here in 1944. Yet to follow were Neptune’s Daughter and Texas Carnival. 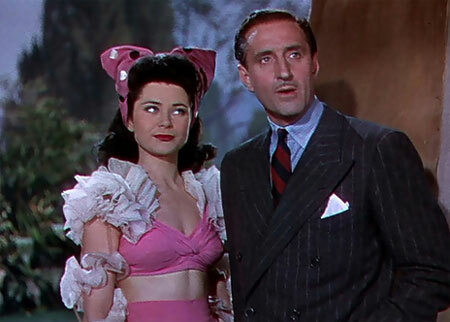 They’d also be seen in Ziegfeld Follies and Red would cameo in Esther’s 1950 flick, Duchess of Idaho. Basil Rathbone appears to be taking a break from his run of black and white Sherlock Holmes’ mysteries and for a change isn’t playing an outright villain as he seemed to be when turning in the cape and deerstalker to tackle something different. 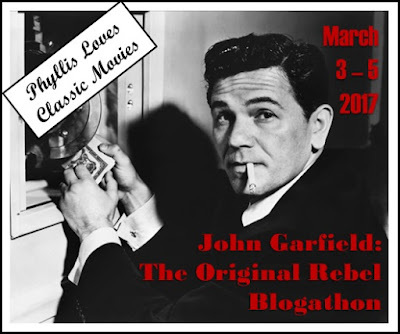 I’m no expert in the choreography of musicals and I’m quite sure Red is no Fred Astaire with the footwork but this proved to be an enjoyable romp mixing the screwball comedy genre with some fine music from Harry James and Xavier Cugat. Knowing both men by name thanks to reading more than a few history books I’m not sure I’d have recognized either one. Having now put a face with the sound I’ll admit to preferring the Harry James Orchestra if given a choice. 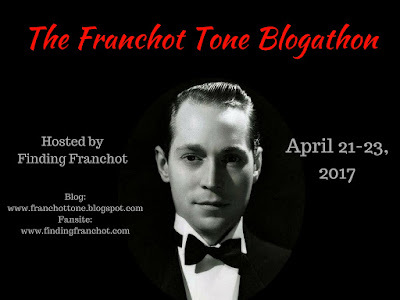 There are a couple of scenes in particular that see Red in some very silent film(ish) predicaments and knowing that Buster Keaton had worked setting up some gags for Red I double checked the trivia section of Bathing Beauty at the IMDB and according to them Buster was indeed involved in one scene where Red is tangling with a very large Great Dane. 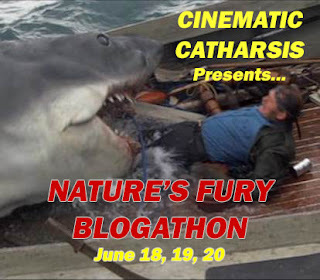 Looking to see Bathing Beauty? 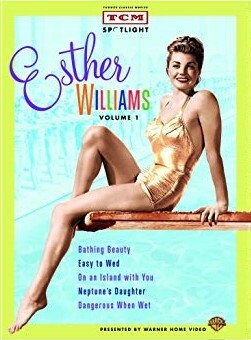 It’s available in one of two Esther Williams’ sets put out by the TCM Spotlight brand if you can locate a copy. 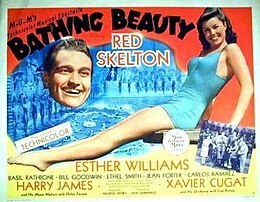 I love how that lobby card makes it look like Red Skelton is the bathing beauty! Well, the WORDING makes it look that way…Esther most certainly grabbed my attention as a bathing beauty first! And in that black-and-white photo, I know that’s Jean Porter up in the hammock, but is that Esther standing next to Red? If so, she looks a lot different when she’s not wearing a swimsuit! Esther is a very pretty gal and yes that’s her next to Red. I’ve seen a handful of titles now with her and they’ve all been enjoyable.